Everyone out of the water. 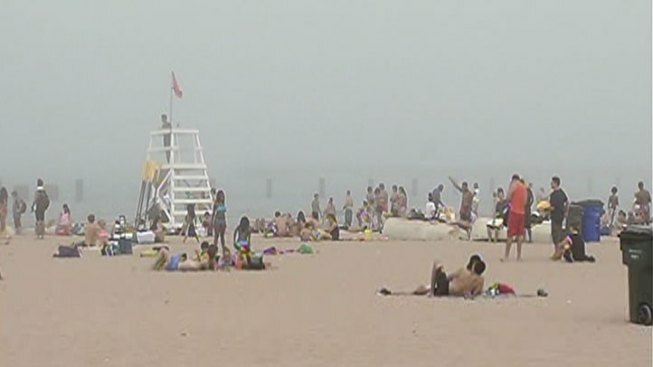 Swimming was banned at all but one of Chicago's beaches Tuesday due to fog. Lifeguards weren't able to keep track of swimmers due to low visibility. All beaches except 12th Street Beach were closed to swimming at about 11 a.m. The beaches themselves are open, but the water is off-limits until the fog burns off, officials said. This fog is called advection fog. It forms as a warm, moist air mass settles over the cooler Lake Michigan waters. Hot and humid air (temps in the 90s, dew points in the 70s) just west of Chicago comes over the cool Lake Michigan waters (60s and low 70s) and forms fog. The near-surface air is cooled to the high dew point (in the 70s) and fog forms. Then, the lake breeze transports the fog from the lake back onto land. The fog is concentrated at very low levels of the atmosphere, with the tops of the taller buildings likely experiencing temperatures in the 90s above the fog layer, because the relatively cool air off of Lake Michigan is quite shallow, the temperature is cooled to the dew point only at near-surface levels. Given the strength of the sun and mixing of higher temperatures just above the ground, the air temperatures even near Lake Michigan should slowly rise above the dew point and the fog will dissipate. What does that mean? Even if you got a break from the heat from the fog…you will start to warm up again very soon. A full beach report is available on the Chicago Park District's website.